Our hugely popular Folly office chairs are now available with eye-catching and colourful deep buttoning. This great new optional extra, when combined with a choice of colours for the seat and seat back, means that businesses can create a look and feel that is unique to their business and in tune with their business branding. Of course, depending on your chosen colour palette it can brighten up office space and inject a little bit of fun or personality in to the workplace. The Folly seating range is a stylish, hardworking chair that is ideal for busy offices (including operator & task chairs), meeting and training rooms as well as looking stylish in boardrooms and receptions. The Folly range is available with many options including high back, fixed or fold-away arms and choice of textile. We also recently added the option of a heavy duty 3 lever mechanism and a cantilever base when a static chair is preferred (e.g. in the boardroom or meeting room) . 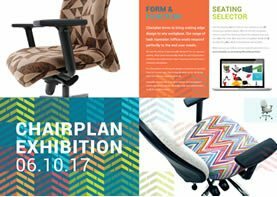 As a UK manufacturer, Chairplan are able to produce the Folly range in your choice of colours… the buttons, seat and seat back can all be different! The choice is yours and may be led by corporate branding, but current popular colours including Blazer (Newport, Oriel and Nottingham) and Xtreme (Bridgetown, Madura, Osumi and Buru). 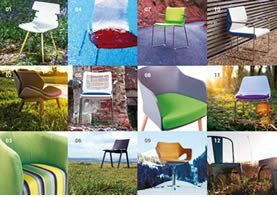 As a UK based manufacturer we are able to offer so many great options to personalise the chair to your needs, which means that you can achieve a bespoke look at a competitive price.